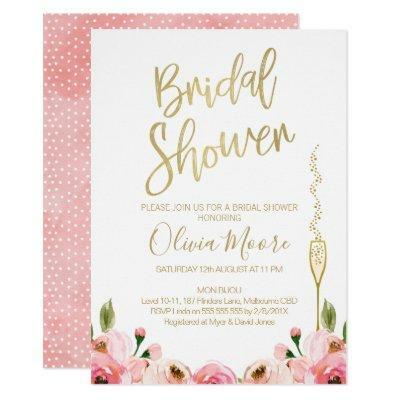 This bridal shower invitation features some floral watercolor roses in various shades of pink and a tall elegant champagne glass in a faux gold texture. The heading is a faux gold calligraphy font that can&#;t be altered. Then background is white and the text is a gold color that can be altered if you like. This simple but elegant bridal shower invitation is ready to be personalized. Same invitation design is also available at the store with the heading "Bridal Brunch".